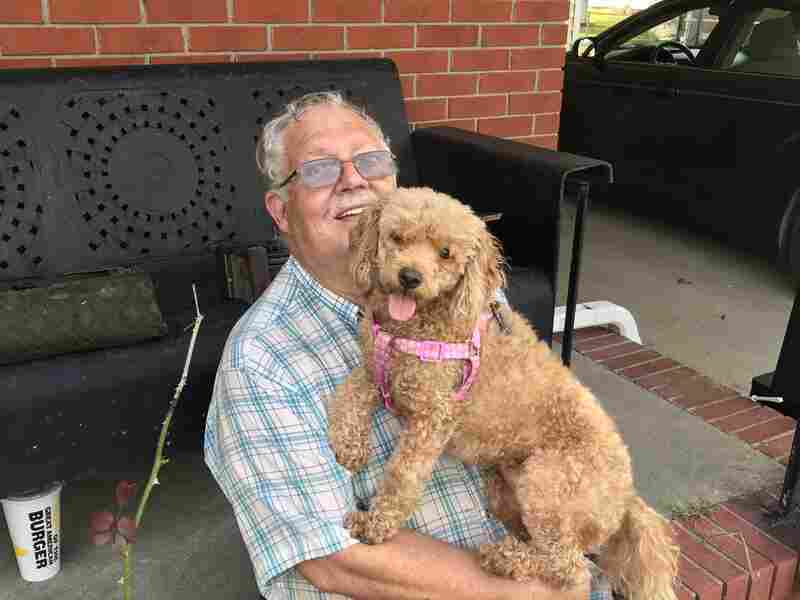 Jerry Gray with his dog, Zoe, whom he also calls Sweetie and Hard Head. Zoe was the only pet his deceased wife, Hilda, would allow in their house. After losing his wife — and now his house — Gray says Zoe means everything to him. "If I lost her, forget it," he says. His small brick ranch is one of four houses next to a busy road leading out of Kinston. All of them are being gutted. "There's all these people," he says, waving his arm toward the heap of furniture in his neighbor's front yard. "The houses are all ruined. They're not coming back." The house behind him originally belonged to his wife, Hilda. They met 16 years ago on a blind date and then, in his words, "shacked up." "She always joked with me because she was 10 years older than me, she always called herself the cougar," he laughs. "She was a good woman." Hilda died three years ago. Gray has kept the house as a shrine to the years they'd had together. The puzzles Hilda did when she got cancer still hang on the wall. The rolltop desk they found at a thrift shop is out on the lawn. Her car is still in the driveway. As he stomps through the waterlogged carpet in his living room, her fluffy brown poodle, Zoe, chases him into the house. In the kitchen, a giant pickle jar full of murky floodwater sits on the floor. "My wife and I used to save pennies in that jar," he says. After they both retired, he and Hilda repainted the house together. They worked together to replace the old windows with new vinyl ones. Hilda is everywhere in the house. And now Gray has to leave it. He didn't have flood insurance and says there's no way he can fix the place. "I never thought I'd be basically homeless," he says. "I never thought I'd be in this situation. And the book of life doesn't teach you how to handle this." Since Hurricane Florence hit, he has been sleeping at his stepson's house, but he says that that's just temporary. "When you get to my age and you got nobody to lean back on, it is tough," he says. "But God will get us through it." By us, he's referring to Zoe, the last pet he had with Hilda. And Gray is not alone. In the wake of Hurricane Florence, thousands of homes in North Carolina have been destroyed. As of this weekend, more than 60,000 people had applied for assistance from the Federal Emergency Management Agency for damage from Florence. For the elderly, a flood can turn into an eviction notice. They're often on fixed incomes and can't afford repairs. Lifting a waterlogged carpet out of their house may be physically challenging for them. So after having water pour into their homes, they're often left with few options other than to leave. At a subsidized senior housing building in Kinston, several residents say that it was Hurricane Matthew two years ago that drove them from their homes. Lawanda Warren, who grew up in Kinston, says these storms are incredibly hard on older people, especially if it means they have to leave a place where they've felt comfortable. "They have to go into senior citizen homes or assisted living, places they didn't want to go," Warrren says. Warren works for the state government, but she came home to Kinston this weekend with her food truck to feed people affected by the floods. She was giving away funnel cakes, hot dogs and popcorn to people in her old neighborhood by the Neuse River. Her family left just before Hurricane Fran hit in 1996. "The house that we lived in, nobody else ever lived in it [after Fran] because it got flooded out," she says. Successive hurricanes from Fran to Floyd to Matthew and now Florence have destroyed some people's houses entirely or have done just enough damage to force vulnerable senior citizens out the door. Warren says it's painful to watch. "You know they want to live out their days being able to hang clothes out on the line or sit on their front porch," she says. These storms cause immediate physical damage, she adds, but they also have deep, lasting impacts on communities.